Actin filaments perform an amazingly diverse number of roles in the cell—ranging from cell division to vesicle trafficking to mitochondrial division. Underlying the distinct roles that different populations of polymerized actin can play are the myriad of proteins that regulate actin polymerization. The formin family of proteins is united by their ability to nucleate actin filaments, overcoming the rate-limiting step of actin polymerization. In recent years, the Higgs lab has extensively studied inverted formin 2 (INF2). In addition to nucleating new actin filaments, INF2 enhances the elongation of actin filaments and accelerates actin depolymerization by severing filaments. Among other roles in the cell, INF2 regulates actin polymerization required for ER-mitochondria calcium transport and mitochondrial division. A subset of formin proteins are regulated through autoinhibition between the conserved Diaphanous Inhibitory Domain (DID) and the C-terminal Diaphanous Auto-regulatory Domain (DAD). While cellular assays show that regulation of INF2 activity requires the DID-DAD interaction, purified INF2 protein is constitutively active in biochemical assays. To reconcile this disparity, the Higgs lab hypothesized that cellular factor enhances INF2 autoinhibition via the DID-DAD and properly regulates INF2 activity. To identify the INF2 inhibitor, the Higgs lab utilized a classic biochemical approach. Mouse brain cytosol was run through various column chromatography steps and fractionated. Each fraction was then mixed with purified INF2 protein to evaluate INF2’s ability to polymerize actin. Fractions that inhibited INF2 activity were pooled and continued through subsequent fractionation until the final Brain Inhibitory Fraction (BIF) was purified. While the BIF inhibited full length INF2 activity, it did not inhibit an INF2 construct lacking the DID domain, suggesting the BIF enhanced INF2 inhibition through DID-DAD interactions. When the BIF was separated on a SDS-PAGE gel, five protein bands were visualized and sent for mass spectrometry identification. Notably, cyclase associated protein 1 and 2 (CAP1, CAP2) were identified. CAP proteins can bind actin monomers and enhance polymerization, as well as bind actin filaments and enhance severing. While immunodepletion of CAP2 eliminated the strong inhibitory action of the BIF, the authors found recombinant CAP (purified from HEK293 cells) only weakly inhibited INF2 activity in vitro. Although the differences in inhibitory activity between brain purified and recombinant CAP were puzzling, the authors hypothesized that an addition protein may enhance INF2 inhibition. As CAP binds and co-purifies with actin monomers, they questioned if brain actin vs. HEK293 actin could affect the CAP-INF2 interaction. Following actin-exchange assays, the authors confirmed that recombinant CAP bound to brain actin inhibits INF2 significantly better than CAP bound to HEK293 actin. As most in vitro actin assays utilize actin purified from rabbit or chicken skeletal muscle, the authors also tested the inhibitory action of CAP exchanged with these actin sources. While CAP-chicken actin showed inhibitory activity comparable to CAP-brain actin, CAP-rabbit actin had minimal impact on INF2. To help interpret these disparities in inhibition between actin sources, they probed post-translational modifications of chicken actin by mass spec and identified 4 acetylated residues. Deacetylation of chicken actin by Histone Deacetylase 6 (HDAC6) significantly decreased the inhibitory effect of CAP-chicken actin on INF2 activity, confirming that actin lysine acetylation is key component of CAP-mediated INF2 inhibition. Fig. 1. TIRF microscopy of actin polymerization in vitro. While full-length INF2 (INF2-FL) alone enhances actin polymerization, the presence of CAP-actin strongly inhibits INF2 activity. To understand the physiological role of CAP-acetylated actin inhibition and HDAC6-mediated deacetylation, the authors completed several cellular assays. 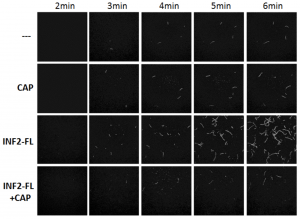 Previous work in several labs, including the Higgs lab, has shown that ionomycin-induced calcium influx in cultured U2OS cells stimulates an INF2-mediated burst of actin polymerization and subsequent mitochondrial division. Interestingly, they found that treatment with Tubastatin A, an inhibitor of HDAC6, blocked the ionomycin-induced actin burst, suggesting that deacetylation of the CAP-actin complex is required for INF2 activation in cells. Supporting this hypothesis, they also found ionomycin treatment transiently decreases the amount of acetylated actin bound to CAP2, as well as the amount of INF2 co-purified with CAP. Interestingly, mutations in the INF2 DID domain have been observed in Charcot-Marie Tooth Disease and Focal Segmental Glomerulosclerosis. Cells transfected with INF2 constructs containing disease-linked mutations exhibit elevated levels of polymerized actin, suggesting these mutations increase basal INF2 activity. Furthermore, these INF2 disease constructs did not co-purify with CAP2 from U2OS cells and were weakly inhibited by CAP-actin in actin pyrene assays. Collectively, these data show that the CAP-acetylated actin complex facilitates INF2 autoinhibition and dysregulation of INF2 activity is linked to disease states. Fig 2. 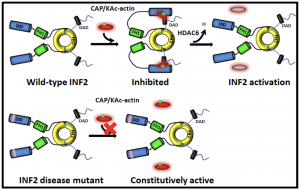 INF2 auto-inhibition is facilitated by the CAP-acetylated actin complex and is relieved by HDAC-6 mediated deacetylation of actin. In this paper, the authors employed classic column chromatography—old-school biochemistry—to identify the cellular inhibitor. In the era of proximity-ligation screens such as APEX2 and BioID, reverting to such a traditional method is quite unusual. The amount of the work that went into isolating the BIF is commendable. The identification of acetylated actin as a required component of the CAP inhibitory complex is surprising. This paper is the first to show a role for lysine-acetylated actin and it will be interesting to see what other cellular processes lysine-acetylated actin influences. How did the lab begin working on INF2? Why did you choose a classic biochemistry approach to identify the INF2 inhibitor? Do you hypothesize that other mechanisms exist for relieving INF2 facilitated-autoinhibition besides the deacetylation of actin? Interestingly, both INF2 and CAP can contribute to actin polymerization and depolymerization (through severing). Is this purely coincidental or do you think there is a connection there? On a related note, while you’ve shown that CAP-Actin inhibits INF-2 mediated actin polymerization (both nucleation and elongation), does it also inhibit filament severing? Do you think acetylated actin may have broader roles than INF2 regulation? 1. How did the lab begin working on INF2? Purely out of curiosity. In 2004, we began working on an uncharacterized ORF in the human genome, with its only two features of interest being: 1) it had formin-homology domains, and 2) it’s domains were organized in a somewhat different manner than other formins. We named the protein Inverted Formin 2 (INF2). At first, we just did biochemical work on it, and found it had cool properties (severing, depolymerization). In 2009, we found that one INF2 isoform is tightly bound to ER, which was bizarre because there was no real connection known between mammalian ER and actin, and INF2 knock-down did nothing to the ER as far as we could see. In 2011, we were then led to mitochondria by a circuitous route, which has been very exciting. Eventually, we wanted to know how INF2 was regulated, and found all the surprises reported here. So, basically, we’ve taken a path deeper and deeper into the woods, being drawn in by curious features at every turn. 2. Why did you choose a classic biochemistry approach to identify the INF2 inhibitor? Honestly, techniques such as APEX2 and BioID would probably not have been successful here. In 2010, we had tried INF2 immuno-precipitation, and had identified many, many potential interacting partners, including many actin-binding proteins such as CAP. While we thought some might be relevant (and we did pursue some), our suspicion was that they could be artifactual due to stable actin filaments in the extract. We definitely found actin in the IPs, but would never have suspected it was regulatory. Though activity-based purification seems a crazy way to do things, this is an approach with which Harry has long experience from his grad school days, but it takes a particular set of circumstances to pull off. We suspected it would be a long route (and it was), with lots of false leads (and there were), and that it would take lots of determination (and it did), but Mu was definitely up to the task! Another key factor was that Mu is a very skilled biochemist. Without that, the project would have moved too slowly and we would have given up. Another key was timing. 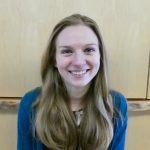 Anna Hatch started the project and showed that the INF2 inhibitory activity could fractionate as two clean peaks by gel filtration, but she was relatively far along in her thesis and we realized it was too risky for her to dive into this. In addition, we did not have a reliable way of producing full-length INF2. Then Mu came along and started on this early in her thesis. In addition, there was a key technological ingredient about the time Mu started, in that a junior investigator (Jason McLellan) introduced a robust HEK293-based expression/purification system that we needed for full-length INF2. So, it was a case of the right person at the right time with the right tools. 3. Do you hypothesize that other mechanisms exist for relieving INF2 facilitated-autoinhibition besides the deacetylation of actin? That is definitely possible. CAP-binding factors, or modifications to the CAP, the CAP-bound Ac-actin, or to INF2 itself could potentially disrupt the interaction. 4. Interestingly, both INF2 and CAP can contribute to actin polymerization and depolymerization (through severing). Is this purely coincidental or do you think there is a connection there? On a related note, while you’ve shown that CAP-Actin inhibits INF-2 mediated actin polymerization (both nucleation and elongation), does it also inhibit filament severing? INF2’s severing activity is still a mystery to us. It is a very potent biochemical activity (much more potent than cofilin), and requires the actin filaments to “age” (by releasing the phosphate product of ATP hydrolysis). As with any severing protein, the severing could serve two purposes: 1) to enhance overall actin polymerization, by creating more barbed ends for elongation; or 2) to enhance depolymerization, by creating more barbed ends for depolymerization! Biochemically, we find that INF2 can depolymerize actin very rapidly, but this is under conditions that might never occur in cells (high INF2: actin ratio). All the same, the transient nature of the INF2-mediated actin burst in cells makes it tempting to speculate that the severing/depolymerizing activity might take part in shut-off of the actin burst. We have no proof for this, and have found it very hard to test because a key region for severing (the WH2/DAD) is also key for INF2 regulation. We have not been able to make INF2 mutants that do not sever (but are still regulated correctly). We are currently testing whether full-length INF2 severs (not yet proven) and whether CAP/Ac-actin regulates this. 5. Do you think acetylated actin may have broader roles than INF2 regulation? We think this is the tip of the iceberg. We find evidence for acetylation on 10 lysines on actin, and are busy identifying the key Ac-lysines for INF2 regulation in particular. However, we think all of the Ac-lysines are probably doing something. With about 200 mM actin in most mammalian cells, and many actin assembly factors present at <1 mM, it is an attractive mechanism to modify a small fraction of the substrate in order to regulate activity. Frankly, why stop with regulation of actin assembly factors? Ac-actin could regulate other processes as well. It is already known, for example, that actin monomers are component of chromatin remodeling complexes that have (as far as we know) little to do with actin filaments. We’ll see!